Gads, are people still looking here for Bad Home Cooking? 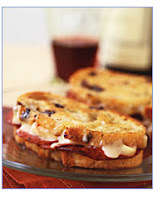 It's at a new locale, www.badhomecooking.com (that's on Typepad). Updated weekly and all. See you there! As often happens, this so-called bright idea started with Audge. Last time I was at my kitchen Goddess friend Audrey Smith's house, she had just a few bites of a blackberry cobbler left on her counter top. She's the kind of woman who whips up things like fruit cobblers for her family. And on weeknights. If my family gets desert at all, it's usually several squares of Ritter Sport chocolate and biscuit, and more often than not, it's usually stolen from the refrigerator by my nits without my knowledge. She gifted me with a bite. It was, not surprisingly, delicious. It was also, she said, "obscenely easy to make." "For someone like you," I muttered. This is my standard refrain whenever Audge tells me how easy something is to make. "No, no," she said. "It even says it here." She pulled out a copy of Cuisine at Home, Aug. 2005. There, on page 49, was the recipe for Summer Blackberry Cobbler with Coconut and Pecan topping. And in the intro, plain as the nose on my face, were the words, "...plus, it's obscenely easy to make." In journalism we call the final paragraph or sentence of a piece the "kicker." You can see why here. Call me naive. Call me gullible. Call me impressionable. But I am easily convinced, and yes, I could probably be the one convinced to buy that bridge in Brooklyn. I re-read these final words, and I looked at the picture, and I ruminated on the taste of that cobbler, seeds still in my teeth, and I thought, "This is obscenely easy to make. I can make it for my BBQ next week." Gentle readers, I can almost hear your hand slapping your forehead. Silly girl, you're saying. Don't waste your time. Buy a pie if you must. Better yet, buy half a dozen Dove bars and call that dessert. And in any case, you're all going to be eating steaks and potatoes and drinking beer and wine and really, who's going to remember anything about any desert? And you'd be right. Toss berries with sugar, tapioca, lime juice, and salt in a bowl. Spoon into a 2-quart baking dish. Blend in the egg. It will get very sticky, like wet Play-Do. 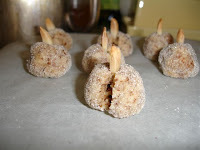 Do your best to arrange this over the berries. Bake cobbler for 45-50 minutes, or until topping is golden and crisp, and filling is thick and bubbly. Cool on a rack for at least 1 hour before serving. Dang. Will your kitchen smell great. A couple of problems. First, I had no lime juice, having thrown away one, withering lime about a week ago. I did have lemons, though, so I used half of that. Was this a bad idea? Probably. But isn't citrus citrus? Secondly, I inexplicably ran out of sugar after the first cup. Since it was 11 p.m., I had no choice but to call Tamlin, the only close neighbor I knew who was still likely to be up, and beg a cup of sugar off her. Luckily, she had it. She had a good laugh at my expense, too. By midnight I was finished. And there was no way in heck I was going to attempt no stinking creme anglaise. I would not describe this as obscenely easy to make. If it is for you, don't mention it to me. Thirdly. We did indeed drink and eat meat and potatoes at the BBQ the next night. And I also forgot all about the cobbler. Two days later, I pulled it out and served a chunk to my kids, who ate part of it with interest, but then said it was too cold. I ate the rest of their portion. Not bad. I could taste the coconut, which I didn't entirely care for. I put it back into the refrigerator...and forgot about it until now. I'd throw it out tonight but for the daunting task of having to wash the dish. Sigh. It all seems a tremendous waste. I might try this again later in the summer, with fresh blackberries. And I'll halve the recipe. And use a pie tin instead of a deep dish. Oh, and I'll have a lime. And enough sugar. Maybe at that point it will have become, if not obscenely easy to make, then at least perhaps not too hard. Audrey, meanwhile, asked for the recipe back, (hope she doesn't mind all the smudges), and has since made it again. Her husband and kids have already eaten it. Eliza, who writes Notes from my food diary, makes a beautiful version of this. Please note that mine did not turn out this beautiful, hence the generic picture of blackberries. Look at that cobbler. Can you blame me for trying? I bought a daikon radish a few weeks ago at Marukai, the giant Japanese supermarket not far from where I live. It's possible to spend several hours at Marukai, perusing unfamiliar condiments and 27 different kinds of dipping noodles, and never even make it upstairs to where the furniture is. I have my Marukai game down, though. I know what I need, and I procure it quickly: Japanese snacks for the kids (Yam-Yam sticks and honey balls), noodles, dipping sauce, "fish bits" (processed fish roll that my kids, strangely, seem to love), Miso paste, fresh fish and of course, some chestnut mochi, because you know, oishi desu, ne? And I swung by the produce section to get me some of those crispy Fuji apples. Then I spied the daikon radishes. Oooh. I was inspired suddenly to try my hand once again at the Japanese Breakfast. And didn't I need a daikon radish to make the dashi - the base for miso soup? I bought one: a large, sturdy specimen. I brought it home. It sat on my counter for a while. I looked up the recipe for miso soup and realized I was mistaken. You don't need daikon for dashi, only kombu, a kind of seaweed, which I didn't have, and bonito flakes, which I didn't have either. I didn't fancy another schlep to Marukai just for these items. 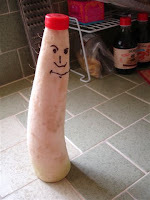 So the daikon sat unused on my counter. I half-heartedly flipped through my Japanese cookbook for ideas on how to use it, but nothing enthused me. So the daikon radish continued to sit on my counter. My kids started referring to it as "The Radish Spirit," after the silent but heaving character in Hayao Miyazaki's fantastic animated feature, "Spirited Away." Then one night I drew a face on it. I added a little bottle-top cap. Not long afterwards, I realized the face kind of resembled Tony's. Seinfeld aficionados will remember the very funny episode called "Fusilli Jerry." Kramer makes a figurine of Jerry out of fusilli pasta. I call this creation: Daikon Tony. Daikon Tony sat on my counter for a few weeks, where he lost water and twisted and withered slowly away. I was forced to throw my creation away, for decorum's sake. One can extrapolate from this that I will very soon, probably this week, be back at Marukai, to procure benito flakes and kombu, and probably some small pieces of salmon to fry up for a traditional Japanese breakfast. Tony - the man, not the radish - is bound by honor to try it. Sardines are very tasty. They taste good on crackers, which means they're good on the Bread of Affliction (matzohs) too. If your foodie friend is visiting you, she will not let you eat these out of the can, hunched over the sink, as you intend to do. Rather, she will dish them into a bowl, spread fresh avocado mixed with freshly ground black pepper and capers onto a matzoh, place a single sardine just so, and hand it to you on a plate. She will make you sit down at the table to eat it. And she will make you use a napkin. And it will be good. Matzo brei is also very tasty. You learned to make it from a Nice Jewish Boy from Long Island many years ago when you were giving the other coast a whirl for a bit. It is his grandmother's recipe. You run several sheets of matzoh under the tap until they're good and wet, shake them out, then crumble them all up into a colander. Then you melt butter in a pan, and fry the damp matzo bits until lightly browned. Then you add three or four eggs, beaten with a little milk, salt and pepper. The resulting scrambled egg and matzo is then eaten, in delicious little bites, with jam and a giant cup of coffee. Your children announce that they love matzo-brei. This will make you feel like a righteous Jew. Carrot salad with avocado and tofu sounded good (well, maybe not the tofu part necessarily), and since the gorgeous Clotilde at Chocolate & Zucchini eats it for lunch every day, you decide you should try it. You took four years of high school French. There's no reason why you should be so impressed with a dish called Carottes Rapées à l'Avocat, but you are. In any case, the recipe, in English, sounds like simplicity itself. You grate the four carrots. You dice your ripe, medium avocado. You toast your sesame seeds. Then you realize that your lemon is too big and that you probably added too much lemon juice and absolutely too much balsamic vinegar, and then, unable to stop the train wreck, you dump in your carrots before it's all mixed and you can't quite scoop it all out again to backtrack. What you're left with is balsamic-flavored vegetable slop. Good thing you opted not to use tofu in the end. Refrigeration for a few hours doesn't fix the problem. You eat most of it anyway, because you sense that, if prepared correctly, it could be very good indeed. And at the very least it's probably healthy for you. Eat the ginger and carrot soup you bought three boxes of from Trader Joe's, for several meals. Make the kids a lot of hard boiled eggs. Color some and call it Easter, prompting the kids to continue eating them, along with their chocolate. Have Tony over for more salmon. Passover is over the next day and dream of the biggest, creamiest bowl of fettuccine Alfredo you can conjure up.